CAPA students stood in a circle for 13 minutes Friday to mark the 19th anniversary of Colorado's Columbine High School shooting. Thousands of walkouts were planned across the country Friday in the latest coordinated rally in response to a February Florida school shooting. 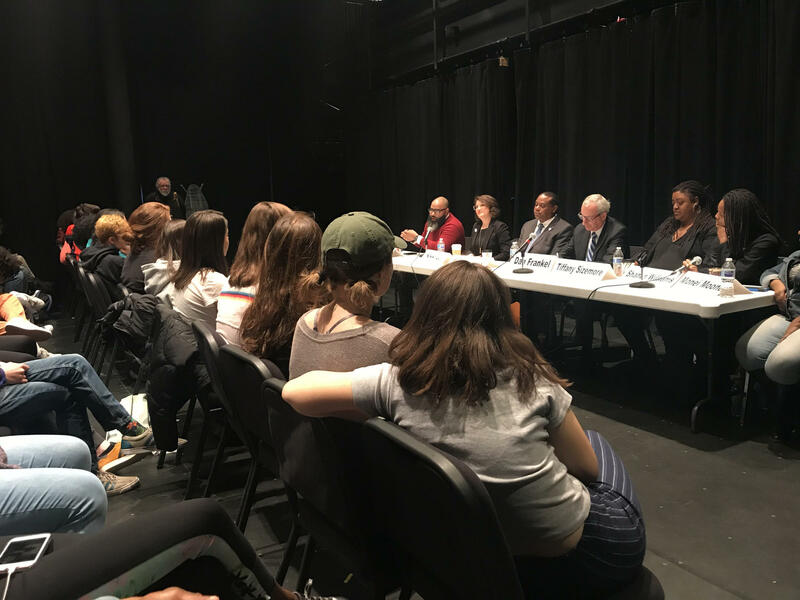 Before the Pittsburgh students marched, they spent the morning listening and questioning local activists and lawmakers at events hosted at Pittsburgh Creative and Performing Arts, a 6 through 12 public school located downtown. CAPA students participate in a forum on gun reform Friday. Student organizer Asha Edson, 16, said the panels were meant to empower students to reach out to their legislators. “No matter what, this does not leave the spotlight. We don’t get to brush this off like Columbine, we don’t get to brush this off like Sandy Hook. We are going to be the change and we are going to stay persistent in that,” she said. The forum included state Rep. Ed Gainey, Rep. Dan Frankel, Shanon Williams with Ceasefire PA and Tiffany Sizemore a Duquesne Law Professor who runs the Juvenile Defender Clinic. They explored topics like gun control reform and ways students can get involved in policy before they are old enough to vote. CAPA Principal Melissa Pearlman said students reached out in early March saying they wanted a space to talk about gun reform. They worked with teachers to connect with panelists. The events Friday were optional and students were given alternatives, including small group discussions, art-making and voter registration and letter writing. “So we want to give them both of those opportunities, certainly the opportunity to be visible and protest and to exercise that right but to do so with every piece of information that they need, who to vote for, what to vote for, what you’re voting about. And to pass that knowledge on to their peers,” Pearlman said.